Chacala is a quaint fishing village of 300 people. 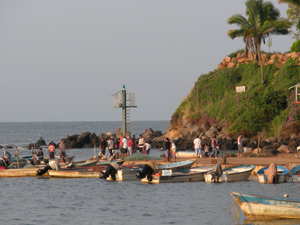 The fishermen work as a collective to sell to the local and regional restaurants and markets. From the deck outside the suites or from the rooftop palapa of Casa de Tortugas, you can watch the fisherman bring in their catch each morning and evening. Breakfast at Chac Mool is a delicious selection of Mexican and American fare. Arturo, the owner, recently brought on a new chef to expand the menu. Chac Mool has a wonderful, open-air coffee house atmosphere with a wall of bookshelves lined with paperbacks brought in by English speaking ex-pats and visitors. After breakfast, take a dip in the sun-warmed infinity pool and then head to the wide beach, only a two-minute walk from Casa de Tortugas. Ask around for Trini who speaks fluent English and can arrange rides and activities. Trini's son, Gustavo, will happily take guests on a two-hour morning boat ride. While there are vast expanses of verdant, jungle-covered hills and vacant beaches along the coast, enclaves of private communities can be spotted along the way. There is a 20-year development plan for the Chacala area, so come now while it seems relatively undiscovered! 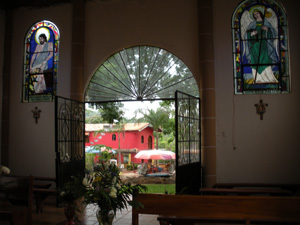 The happy people of Chacala are very friendly and welcoming. It is the last day of the nine day Festival de San Rafael in October (San Rafael is the saint of fishing).The parade participants gather slowly at the end of the cobblestone main street by Chico’s Restaurant. Although, it is scheduled for 9 a.m., the procession begins around 9:45 a.m. with a banner announcing the festival followed by four elderly men carrying a platform with a statue of San Rafael. 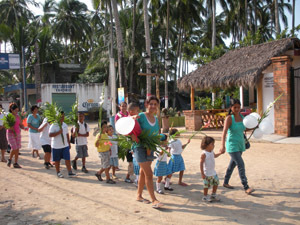 Villagers of all ages, including a uniformed class of pre-schoolers proceed down the street carrying palm fronds and gladiolas. A group of women sing while a small band of musicians walk behind. Bringing up the rear is a very slight elderly man with a cigarette in his mouth. Every few minutes he uses the cigarette to light the end of one his rocket-like fireworks that would soar up into the air until it erupted in a loud “bang.” The procession continues to la marina then to a small, beautiful church where the priest is waiting to lead a service. If you're lucky, you could be invited to the pot-luck lunch of homemade local Mexican fare after the service. In the evening, enjoy a beautiful dinner of very fresh Mahi-Mahi and shrimp (caught that day) at Las Brisas right on the beach.